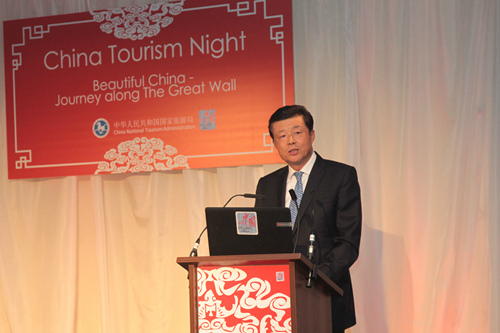 I warmly congratulate China Tourism Night 2014! The theme of this evening is ‘Beautiful China—Journey along the Great Wall.’ This reminds me of the widely acclaimed documentary Wild China. This co-production of BBC and China Central Television was an exceptional exploration of the beauty of China’s nature, history and culture. The recent survey on perception of China in British primary and middle schools shows that the Great Wall is the most recognised and most desired tourist destination in China. So the organisers of this evening have made a wise choice! The event tonight enjoys three favorables. First, favorable timing. Now, China-UK tourism cooperation is advancing by ‘leaps and bounds’. When Chinese Premier Li Keqiang visited Britain in June, the two governments designated 2015 as the year of China-UK cultural exchange. A great variety of cultural activities will be staged in the year. Friendship between peoples is the foundation of state-to-state relations. Tourism is an essential part of our cultural exchange and has become a bridge strengthening links between Chinese and British people. I believe that China-UK cultural exchange year is an excellent opportunity to raise our tourism cooperation to a higher level. This will in turn further deepen friendship between our people. The second favorable is the improved tourist conditions and capabilities in China. China’s appeal to tourists is significantly advancing. China is pressing ahead with reform and openness in its tourist industry. The aim is to improve the offering to foreign tourists by raising the quality of products and promote all round improvements. Statistics show that in 2013 China’s revenues from its tourism sector totaled 2.9 trillion RMB with 3.25 billion domestic tourists. This made China the world’s largest domestic tourist market. The number of China’s outbound tourists stood at 97.3 million, leading all other nations in the world. According to World Tourism Organization, in 2013 outbound Chinese tourists spent more than others in the world. The number of inbound tourists and the income thereof both ranked the fourth in the world. I am sure that with better tourist infrastructure and public services, China will offer tourists from UK and around the world improved services, a better environment and more satisfying experience. The third favorable is the fast growth of people-to-people exchanges. The Chinese and British people are developing a deeper affection for each other. They also have a growing interest in each other’s culture. Both China and the UK have a large tourist sector. We are each other’s main source of inbound tourists. Therefore we have a lot to offer each other. The Pew Research Centre report last July shows that Britain is the friendliest European country to China. Records of China National Tourism Administration show that in 2013, British people made 630,000 visits to China. Likewise, Britain is one of the most popular destinations for Chinese tourists. · Creating the most convenient means for tourist payments. · And providing appropriate tourism insurance. All these aims can be secured through deepening cooperation between our tourist sectors. In history, the Great Wall used to be a military defence work to guard China from foreign invaders. Today, the Great Wall has become a name card introducing China to people around the world. The exciting reality for foreign tourists visiting China is that they discover a treasure trove of tourist resources. The Great Wall is just one shining pearl of this rich treasure. All these speak volumes about China’s natural marvels. I welcome more British friends to the Great Wall to become heroes! I also welcome you to see other parts of China and experience for yourselves China’s natural beauty and the richness of its culture. I am sure that visiting China will enable you to contribute to better mutual understanding between China and UK. In turn, this will deepen friendship between Chinese and British people. 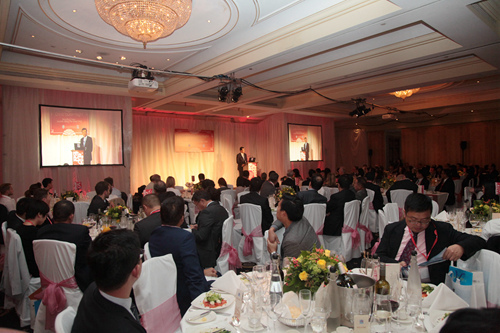 In conclusion, I wish China Tourism Night 2014 a complete success!